God’s salvation causes shame. After God atones for your sins, then you will have shame. God wants his people to feel shame. I will establish my covenant with you, and you shall know that I am the Lord, that you may remember and be ashamed, and never open your mouth again because of your shame, when I atone for you for all that you have done, declares the Lord God” (Ezek 16:62-63, see all translations). According to Ezekiel 16, God makes atonement, and then you will be ashamed. Our shame is the purpose and consequence of the atonement. Israel will feel disgraced after God renews the covenant relationship. Before our spiritual regeneration, we had no (or little) sense of shame before God. Our sin brought shame upon ourselves and God (see previous post), but we hardly realized the disgrace we caused. Then, after salvation, the Spirit’s conviction creates a healthy sense of shame for our sin. In Ezek 16:15-16, Israel’s behavior was spectacularly shameless. God sought to save them from spiritual numbness and to awaken their souls to sense shame. This “post-atonement shame” refers to the personal, affective sentiments of shame, not the public evaluation from God. It’s “subjective” shame, a personal sense of disgust and remorse for dishonoring a superior. Once God initiates the covenant and restores Israel, then they will see their ways as shameful and shaming, repent from them, and begin honoring God as they ought (see JSOT article on Ezek 16:59-63). Blushing is the color of virtue. When the heart has been made black with sin, grace makes the face red with blushing: “I am ashamed and blush to lift up my face” (Ezra 9.6). The repenting prodigal was so ashamed of his excess that he thought himself not worthy to be called a son any more (Luk 15.21). Repentance causes a holy bashfulness. If Christ’s blood was not at the sinner’s heart, there would not be so much blood in the sinner’s face. John Piper’s category of “well-placed shame” (contra “misplaced shame”) helps explain this dynamic. Misplaced shame is when we feel shame for the wrong reasons (typically before people); well-placed shame is when we feel shame for the right reasons (typically before God). Psychologists similarly contrast “discretionary shame” and “disgrace shame.” Atonement for sins leads to well-placed, discretionary shame. Salvation reorients our sense of shame around the glory of God. Christians should feel an appropriate sense of shame when they dishonor God. After God brings us back into a covenantal relationship, we should be appalled at the ways we disgrace him (i.e., 1 Cor 6:5; 15:34). The problem with an unsanctified conscience is not foremost the absence of guilt, but the incorrect attribution of shame and honor. The gospel transforms morality not from shame to guilt, but from misplaced shame to well-placed shame. According to Hebrews 13:18, a “clear conscience” is not marked by legal innocence, but by a “desire to live honorably in every way.” Spiritual maturity is when your personal emotions of honor and shame align with the divine realties of honor and shame. 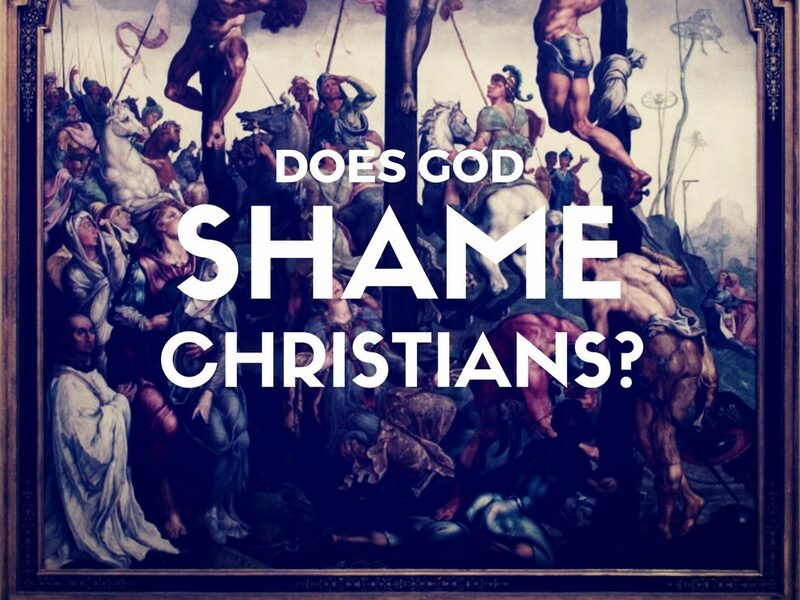 ‹ Can You Shame God? This is psychological shame not spiritual. I would disagree. You would have to remove the spiritual language of the post itself to make it humanism. Redemption removes shame and restores honor in the communal sense. The shame in this post is what we feel (or have) as we realize the dishonor we have given to God. I believe the post is spot on. The spiritual language confuses psychology and feelings with a fact. Just as Guilt in a biblical sense is a fact we may or may not feel guilty. The problem with reducing Guilt to feelings is that the facts of a transgression are left out. True Guilt leads to Conviction not Condemnation. Human attacks lead to Condemnation. True Guilt before Justification is eternal. Afterwards it is temporary and remove as far as the east is from the west after confession. Shame is similar. Granted, we may experience shameful feelings after we have had True Shame removed by redemption/adoption. Psychological \ Emotional Shame cannot be removed by redemption only by conformity to the group norms. we have no hope of freedom and will continually “Fall back into fear because we think of ourselves as slaves. Romans 8 is clear. “You did not receive the spirit of slavery to fall back again into fear. You received the spirit of Sonship whereby we cry out Abba Father as heirs of God and joint heirs with Jesus”. Never are we to think we are back at Slaveship because we forever have Sonship! No condemnation and no shame for eternal sons of the father.